Reindeer moss is actually lichen that contains chlorophyll and is capable of producing its own food. Growing in masses that rarely reach more than 7 inches in height, reindeer moss is soft and spongy when wet, but when dry it becomes a crisp plant that crunches when stepped on. Reindeer and caribou in northern climates graze on reindeer moss as their primary source of food, thus its name. 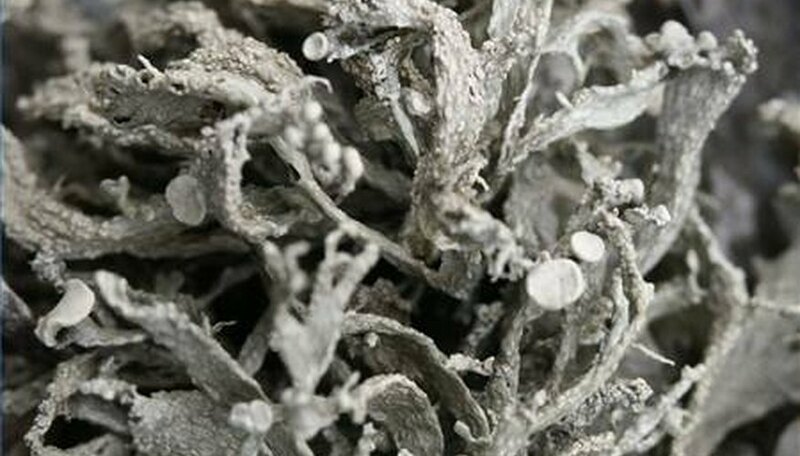 Used in crafts and as miniature trees, reindeer moss must be preserved properly to avoid crumbling. Collect reindeer moss while it is fresh and pliable, but not wet. Use care to remove the lichen with as little soil attached as possible. Remove any dirt or plant debris by shaking or brushing lightly with a soft brush. Combine equal parts denatured alcohol and glycerin in a large bowl. You will need enough to cover your reindeer moss. Soak the reindeer moss in the solution for 30 minutes. Remove and allow to drip. Place on folded newspaper or paper towels. Allow to dry completely in a well-ventilated area. Use in craft projects or as tree canopies to accompany model landscapes. Preserved lichen makes a great addition to natural wreaths and topiaries for holiday decor. Work in a well-ventilated area away from heat or flames.